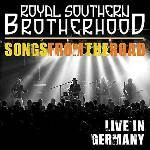 How much you need to own a copy of Royal Southern Brotherhood’s latest disc, recorded live during a recent date in Bonn, Germany, is probably going to depend on how badly you need a concert souvenir from this blues-rock supergroup. Or, alternately, how many times you’ve already worn out their fine 18-month-old debut. For those of you who missed it, RSB is a collab between Cyril Neville, who needs no introduction to readers of this magazine, guitarist Mike Zito, fresh off his recent hit album Gone to Texas, Gregg Allman’s son Devon, who leads Honeytribe, bassist Charlie Wooton, and Derek Trucks Band drummer Yonrico Scott. The result is about what you might imagine: blues-rock with a funkier edge than usual, a good bit of improv, and the added benefit of three solid vocalists behind the mic. But if you did pick up that debut up, don’t expect too many surprises here. Aside from an extended 13-minute workout on the Grateful Dead’s “Fire on the Mountain” and a gritty closing attack on the Stones’ “Gimme Shelter,” not much has changed from the studio—most of the album is represented here and while the guitar wrangling is a little flashier, these versions aren’t appreciably different than those on the debut. A bunch of roots vets like these are always gonna sound better live—to quote both Obama and one of their tunes, they’re more “fired up and ready to go,” and they really tear the top off of “Mountain,” seesawing back and forth from Garcia’s gently cosmic wah to Duane Allman’s beautiful shriek. But Songs from the Road, which not coincidentally comes with a DVD of the show, only makes sense if you missed them last time they came to town. It could very well get you fired up for their next visit, though.